iPads, mobile phones, tablets and many other digital devices feature in the lives of children from the moment they are born, but what is the place of these technologies in children's early years and learning experiences?In the age of the `Techno-Tot' this edited collection focuses on exploring the potential of what children can do with technologies, rather than what technologies can do for children. 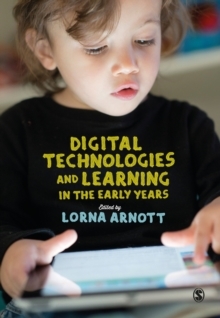 With chapters written by a range of international authors, this book:offers an evidence-based discussion of children's experiences with technologies in early years education broadens our understanding of technologies in early years, beyond the typical focus on screen-based media details the child's `story' with technology offers a range of case studies from the UK, USA, Australia and Europe. Lorna Arnott will be discussing key ideas from Digital Technologies and Learning in the Early Years in the SAGE Early Years Masterclass, a free professional development experience hosted by Kathy Brodie.